This was another tricky plant drawing. The main problem was that the last of the light was hitting everything from behind and trying to get the glow on the backlit tulips probed extremely difficult. Probably I should have started with the whole thing darker, but it was very light behind the tulips too. Anyway, I have done my best to record the utter disinterest which stone gargoyles have for red tulips. 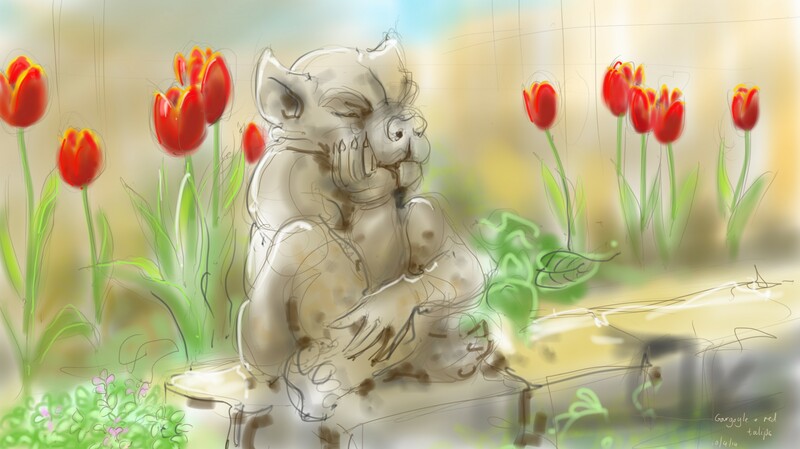 This entry was posted in Plants, Portraits and tagged art, drawing, garden, gargoyle, illustration, phone sketch, samsung galaxy note 3, sketch, tulips on April 10, 2014 by Nancy Farmer. I’m glad some of your art is just whipped up and thrown out there. Kind of lets us see the creative process. Even so, it is still wonderfully good. And, as you know, perfection is unattainable.